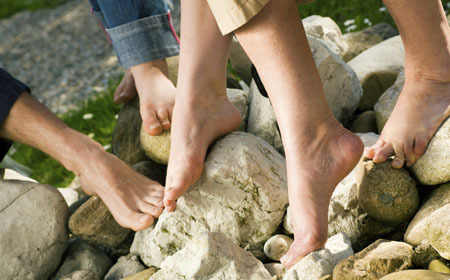 Grab your NO-COST Toenail Fungus Consultation with leading Forest Hills-based podiatrist Dr. Elvira Callahan. Find out how our 95%-effective, FDA-approved, no-muss, no-fuss laser treatment can work on your embarrassing, unsightly fungal toenails. Finally you can have some RELIEF from your toenail fungus. And all with NO Oral Medications, NO Lotions, NO Anesthesia! Stop letting this gross fungus keep your feet under wraps when everybody else is sporting sandals, flip flops, or open-toed heels! This limited time offer of a free consult and promotional pricing expires soon! So act NOW! Don’t put this off. It is so simple to get rid of this problem in your life once and for all. Just fill out our quick contact form to request a consultation, or give us a call today at (718) 275-7590 to set up an appointment. Maybe you’ve tried some kind of lotion or cream before and it didn’t work? No problem. No gunk here. Maybe you’ve been on medications for your fungus, to no avail, or even worse, seen it result in side-effects more icky than the toenail fungus itself? No medications (and no worries) with this treatment. Maybe you’ve been living with your fungus for so long now you just can’t really believe it’s possible to knock it out for good? You are in for an exciting surprise. A fungal infection CAN be destroyed — with the right treatment, and with the right technology. Get ready to have your socks knocked off by something completely different! Dr. Callahan’s treatment for toenail fungus is the safest and most effective option available in the Forest Hills area. Put simply, if this doesn’t take care of your toenail fungus, you don’t have toenail fungus. BUT, if it looks like toenail fungus, feels like toenail fungus, and yes, smells like toenail fungus — it is more than a safe bet that you’ve got toenail fungus. In which case, prepare yourself for a radical change to your comfort, your confidence, and your shoe wardrobe! No one wants to suffer with fungal toenails. They look terrible, feel terrible, are downright ugly, and most of all shamefully embarrassing. Frankly, they just aren’t healthy. Fungal toenails are sick toenails… infected toenails. We get rid of that infection for you — wipe out the fungus completely — so your healthy nails can grow back in, and you never need worry if someone is looking at your toenails (or avoiding looking at your feet entirely because they’re worried you will notice them looking). At the end of the day, you just shouldn’t have to be worried about how your toenails are affecting the way people see you. That’s crazy. Especially if you live anywhere near Forest Hills, NY, when such an easy solution is available to you. So let’s sum up … How do you get infection-free toenails? Call us right now at (718) 275-7590. Set up your free consultation. You will come in for one or two quick visits, in and out, and moving onto the more important things in your busy life. No worries about oral medications (or any of their side-effects). No concerns about lotions or creams (which never work anyhow). No worries over anything surgical (so no anesthetics needed). Just in and out, a few quick visits, and you’re done. Simple and easy. But really, really effective! Watch delighted as your healthy nails grow back in! Are you sick of having conversations with people who are preoccupied with your toes, instead of focusing on what you are saying? Or wondering what it would be like to walk around confidently at the pool, or beach, let alone at your local grocer in flip flops? If you are reading this, you are clearly fed up with dealing with funky toenails. The good news is, if you have been suffering with toenail fungus, and you live in or near Forest Hills, NY, you have found the right doctor to end your fungus problems and restore your fresh, healthy, fungus-free toenails. 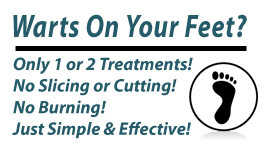 Dr. Elvira Callahan of Tender Footcare in Forest Hills, NY, in Queens, is now offering the safest and most clinically effective treatments for toenail fungus available today. Enough is enough. Don’t waste another minute of your time or mental energy on what your toes look and feel like every waking moment of your day. Let’s get you in here, see what you have, and just take care of it for you. Put an end to your toenail fungus problem today. This limited time offer for a no-cost consultative examination and reduced promotional pricing on the toenail fungus treatment expires soon. You’ve suffered with toenail fungus too long. Stop putting this off, and take action right now. Fill out our Contact Form to request more information, or just give us a quick call at (718) 275-7590. We look forward to meeting you soon at our Forest Hills office — and making your toenail fungus problem a thing of the past! Click Here To Visit Our Other Website As Well! And Check Out Some Of Our Other Treatments Below! 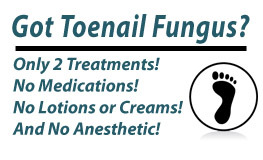 Looking for the most effective toenail fungus treatment in Forest Hills? 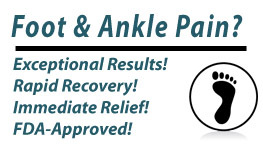 We are also equipped with the safest, most effective laser to eliminate plantar warts. Aches and pains? Recovering from an injury? We can take care of that too!